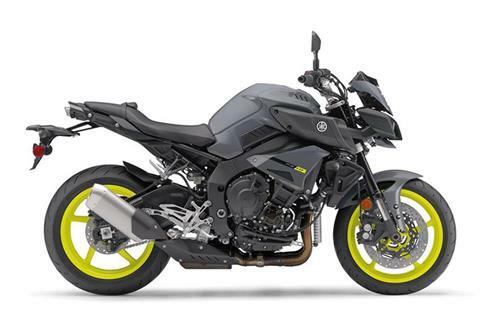 All-new FZ-10 features powerful R1-spec 998 cc Crossplane Crankshaft engine, traction control, ABS, D-Mode & YCC-T. COMFORTABLE, UPRIGHT ERGONOMICS: FZ-10 riders look forward to every ride thanks to upright ergonomics that perfectly balance sporty riding feedback and relaxed comfort, with a tapered aluminum handlebar and ideal placement of the seat and footpegs, plus a hip stopper that braces the rider under maximum acceleration. The sculpted 4.5-gallon fuel tank design allows for a solid feeling of knee grip and lower body control. 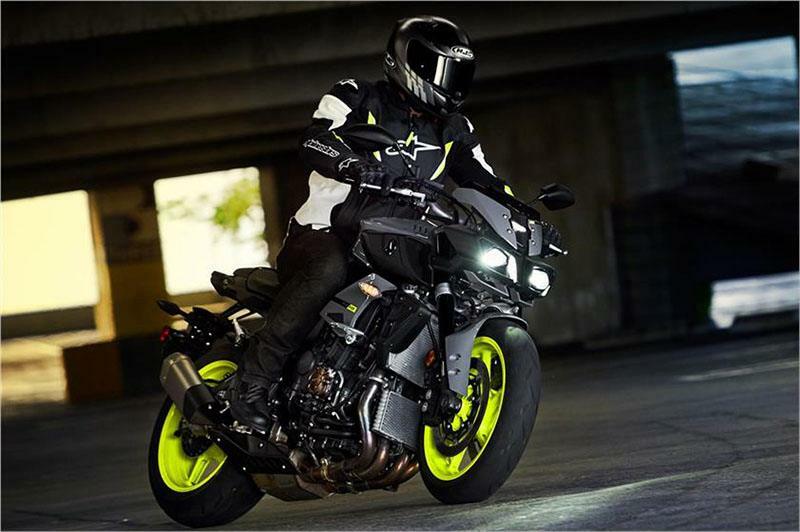 HIGH-PERFORMANCE LED LIGHTING: In addition to LED turn signals, running lights and taillights, the FZ-10 features compact LED headlights for stunning illumination and state-of-the-art style. The mono-focus headlight elements draw very little power but produce a crisp, brilliant beam of light for confidence and visibility in low-light conditions. 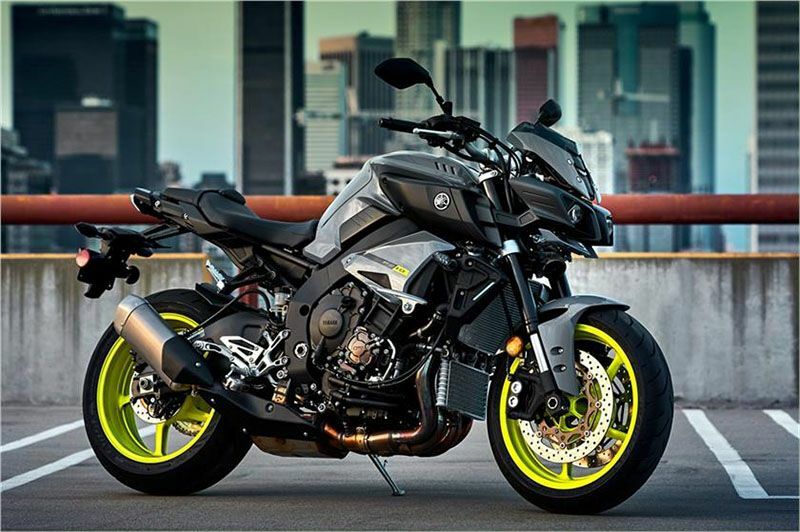 AGGRESSIVE STYLING: The FZ-10 displays raw aggression from every angle, with a muscular central core that highlights the machine’s power and unmistakably futuristic styling. With its belligerent design and unique elements—including the compact frame-mounted front mask and dynamically shouldered fuel tank—the FZ-10 stands out as the new king of the FZ series. READY TO ACCESSORIZE: The FZ-10 arrives ready for personalization, with exposed hardware ideal for mounting a range of Genuine Yamaha accessories, including windscreens, chassis protection and other items. A standard 12V DC power outlet is ready to recharge your personal mobile devices or various electronic accessories. 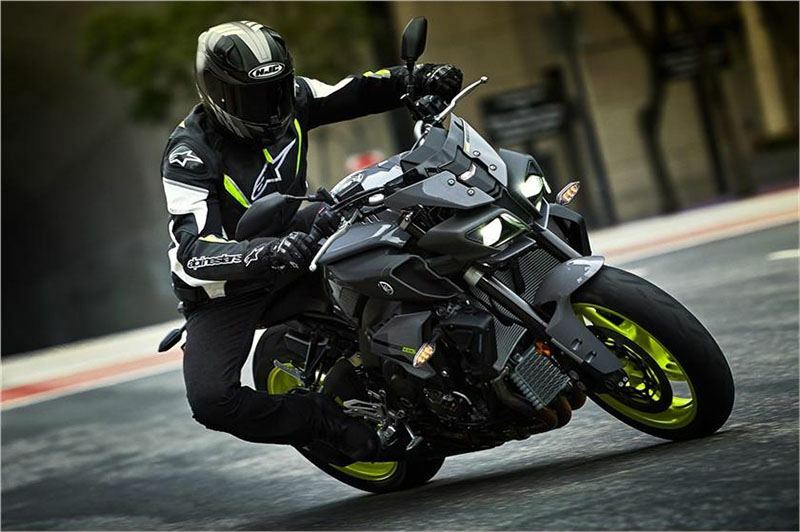 DELTABOX® ALUMINUM FRAME: The FZ-10 uses an aluminum Deltabox frame derived from the YZF-R1 superbike to create a lightweight and responsive chassis built for agility, featuring an ultra-compact 55.1-inch wheelbase. The frame uses a strength-rigidity balance developed especially for the FZ-10, and uses the engine as a stressed member of the frame for optimal balance and cornering performance. FULLY-ADJUSTABLE KYB® FORK: The FZ-10 features an inverted KYB® front fork with 43mm inner tubes and a 4.7-inch stroke offering full adjustability, for excellent front-end feel and road holding along with a tuning range ready for a wide range of street conditions. LINKAGE-TYPE KYB® SHOCK: The four-way-adjustable KYB® piggyback-style shock uses a rear bottom link pivot position that is optimally placed to provide optimal handling and excellent transmission of engine torque to the asphalt. Like the front fork, the FZ-10’s rear suspension offers a wide range of adjustment and a smooth, well-controlled 4.7 inches of wheel travel. 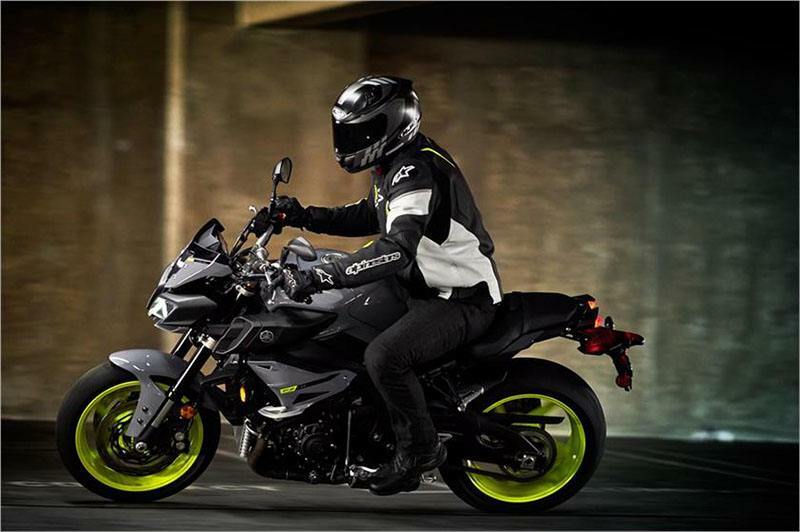 LIGHTWEIGHT WHEELS AND HIGH-PERFORMANCE TIRES: The FZ-10 rolls on lightweight 5-spoke aluminum wheels for nimble steering and suspension feel. 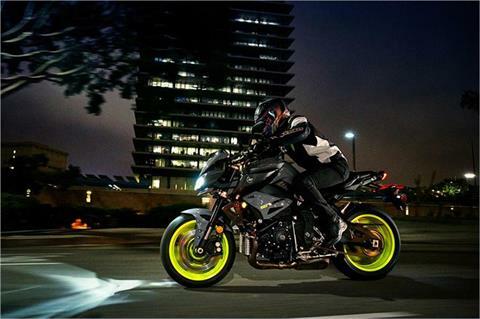 High-grip Bridgestone® Hypersport S20 tires—a 120/70ZR17 front and a huge 190/55ZR17 at the rear—feature optimized internal structures engineered specifically for the FZ-10, for chassis-matched handling and stability. 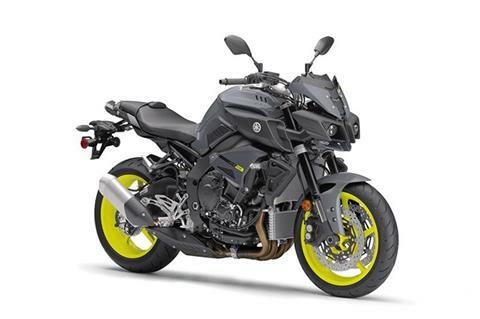 YAMAHA CHIP CONTROLLED THROTTLE (YCC-T) WITH ADJUSTABLE D-MODE: Like Yamaha’s championship-winning R-series supersport machines, the FZ-10 features YCC-T, a ride-by-wire throttle system that provides precise engine control. 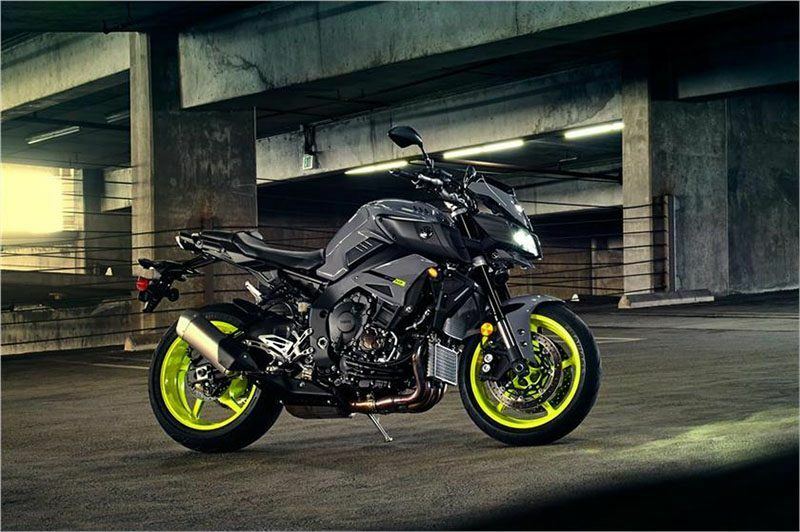 Thanks to YCC-T, the FZ-10 also offers D-MODE, which allows the rider to select a preferred engine response at the flick of a switch. Standard Mode (STD) provides a smooth throttle response ideal for all conditions. A Mode offers a sportier response at low- and mid-rpm, while B-Mode provides the sharpest and sportiest response from the powerful engine. 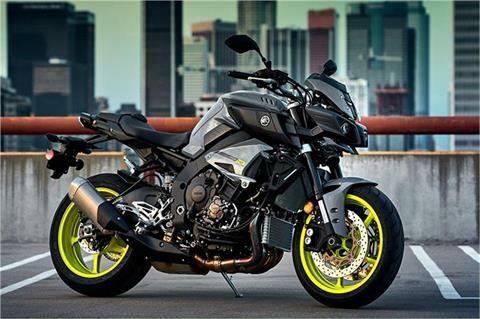 CRUISE CONTROL SYSTEM: The FZ-10 includes a cruise control system powered by the YCC-T. Using the left handlebar switchgear, the rider can easily select or adjust a set speed to ease long-distance touring on the highway, improving rider comfort. ALL-LCD INSTRUMENT PANEL: A highly-legible instrument display provides crystal clear information for the rider at a glance. This all-LCD “glass cockpit” is lightweight and compact, with a large speedometer display and bar-type tachometer. The panel also includes a fuel gauge and fuel economy readouts, a gear position indicator, clock, odometers and warning indicators. An upshift timing light is also programmable to the rider’s preferences. LATEST GENERATION CROSSPLANE CRANKSHAFT ENGINE: The potent 998cc inline 4-cylinder engine features the same Crossplane Crankshaft technology developed in Yamaha’s renowned YZF-R1 superbike. The Crossplane design nearly eliminates inertial engine torque to provide a direct connection between the throttle and rear wheel, for maximum traction and linear torque feeling. Tuned specifically for the needs of the high-performance street rider, the FZ-10 engine develops awesome low- and mid-rpm torque with arm-stretching top-end power. CUTTING-EDGE ENGINE DESIGN: The FZ-10 motor features the very latest in engine design to create the ultimate high-performance street sportbike. Engine reliability is ensured with strong, lightweight forged pistons and carburized fracture-split connecting rods moving through an extremely rigid, closed-deck cylinder block. The engine’s cylinders are slightly offset to reduce friction losses, with plated bores for excellent heat dissipation and cylinder sealing. 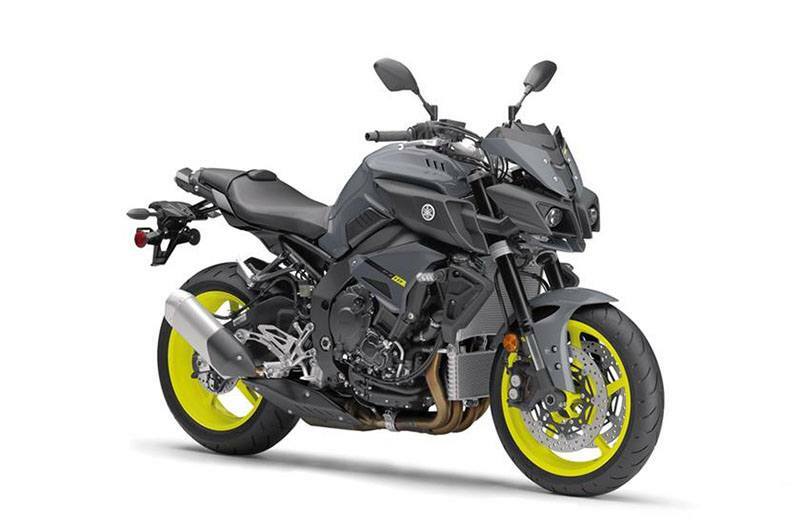 LIGHTWEIGHT EXHAUST SYSTEM: The FZ-10‘s exhaust system is manufactured from durable stainless steel with a lightweight titanium muffler. A compact midship exhaust chamber contributes to mass centralization for improved handling. Exhaust flow is regulated by Yamaha’s Exhaust Ultimate Power valve (EXUP®) system to provide optimal exhaust back-pressure across the entire rpm range, further improving efficiency. 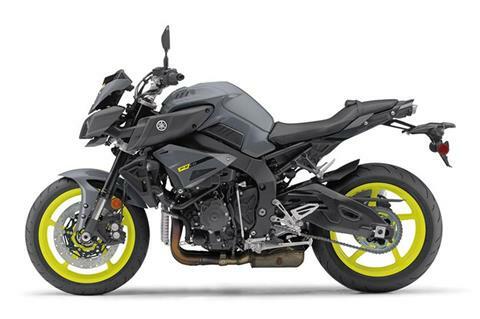 ADVANCED CLUTCH: Yamaha’s assist and slipper clutch is used to give the rider smoother, more confident downshifts when entering corners aggressively, as well as a lighter pull effort at the lever, all while easily handling the torque of the FZ-10’s high-output, inline-four motor. LATEST GENERATION CROSSPLANE CRANKSHAFT ENGINE: The potent 998cc inline 4-cylinder engine features the same Crossplane Crankshaft technology developed in Yamaha’s renowned YZF-R1 superbike. Tuned specifically for the FZ-10™, this engine develops awesome low- and mid-rpm torque with arm-stretching top-end power. 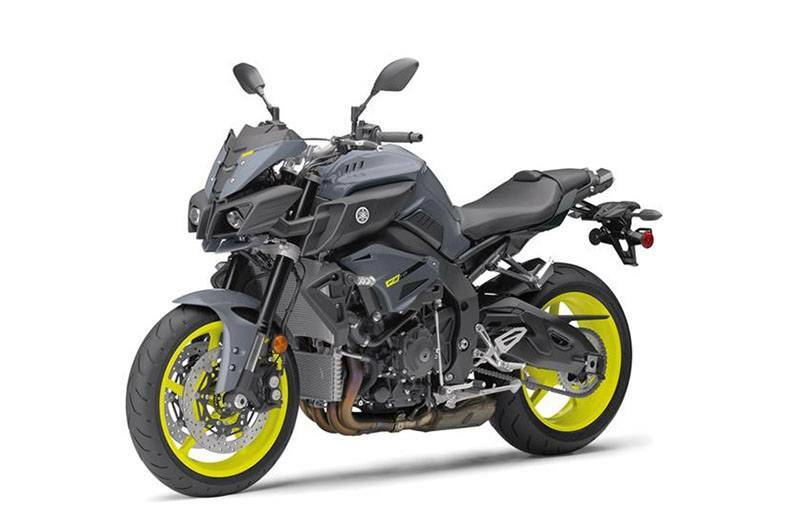 YAMAHA CHIP CONTROLLED THROTTLE WITH D-MODE AND CRUISE CONTROL: The FZ-10 features YCC-T®—a ride-by-wire throttle system that provides exceptionally precise engine control—and D-MODE, which allows the rider to select a preferred engine response at the flick of a switch. The FZ-10 also includes cruise control for improved highway cruising comfort. DELTABOX® ALUMINUM FRAME: Like the YZF-R1® superbike, the FZ-10 uses an aluminum Deltabox frame to create a lightweight and responsive chassis built for agility, featuring an ultra-compact 55.1-inch wheelbase. FULLY-ADJUSTABLE KYB® SUSPENSION: The FZ-10 features a fully-adjustable inverted KYB® front fork and a four-way-adjustable, linkage-type KYB® shock, for excellent road holding along with a tuning range ready for a wide range of street conditions. 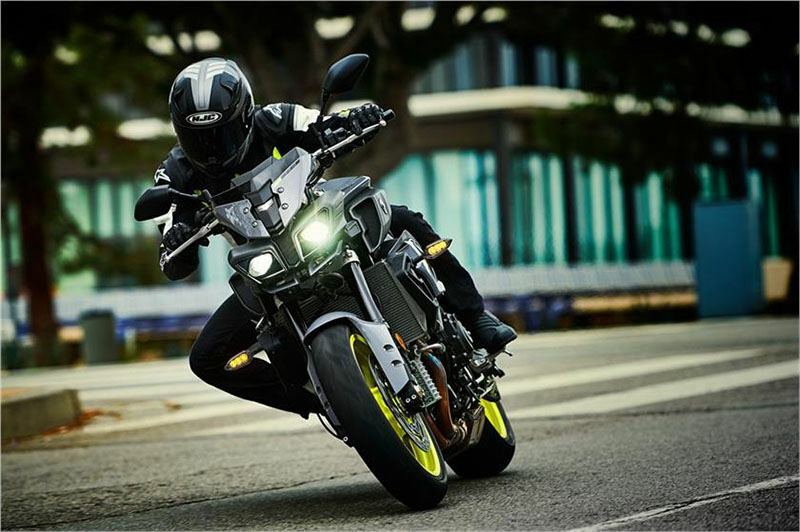 AGGRESSIVE ERGONOMICS AND STYLING: The FZ-10 displays raw aggression from every angle, with upright ergonomics that perfectly balance sport riding feedback and relaxed comfort. High-tech LED lighting and an all-LCD instrument panel boost both style and function.